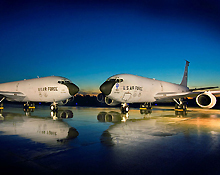 Grissom Air Reserve Base is one of twelve Air Force Reserve Command (AFRC) facilities in the US. The base is one of the few "stand alone" facilities. Grissom is located on 1,100 acres of land, nestled in the corn and soybean fields of north-central Indiana. Grissom is an easy drive to Fort Wayne, Indianapolis and Chicago. The base is home to the 434th Air Refueling Wing and is one of only five Air Reserve Bases in the Nation. The mission of the 434th ARW is to provide mid-air refueling to long-range bombers, fighters, and cargo aircraft. The KC-135's provide support to all major commands of the Air Force as well as the Navy, Marine Corps and allied nations.